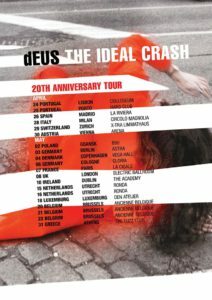 As Tom announced in Brussels last summer, dEUS will hit the road for the 20th anniversary of The Ideal Crash. The band will play no less than 20 concerts throughout Europe. The album will also be re-released in a re-mastered version. The first dates have already been announced.